Radical liberal activists believe that the 1st Amendment gives them the right to piss in the faces of their employers. NFL players and the leftwingnut media think they have a right to stage their protests on the playing field owned by the NFL. Black identity extremists think they have a right to walk on highways blocking traffic to force people to acknowledge them. The Left has gone out of control because Obama and Hillary are using his army of thugs to assault the nation on every side using the façade of social justice. This all has evolved from leftist ideology being forced on American culture by corrupt leftist judges shutting down businesses that do not submit to their demands. Now the media is demanding the NFL punish any owner who instructs players to obey the league’s code of conduct and stand for the National Anthem. Do these stupid fools not realize that the owners ARE the NFL? The answer is; 21st century American liberalism. The problem with dysfunctional liberal mentality is that they do not believe that their rights end where someone else’s rights begin. They believe they have a right to impose their ideology on all others and force them to comply. This is the bare essence of leftist ideology; submit or suffer. This is not the same as a parent who spanks a misbehaving child. This is the same as a parent that abuses a child. People who lack a moral compass cannot tell the difference between corporal punishment and abuse. That is why they become abusers and then rebel by declaring there should be no corporal punishment. They do not comprehend the difference between punishing a child who is behaving badly with punishing a child because they don’t do what they want. For example; a child takes a toy that could harm him and you telling him not to play with it because it’s dangerous or he’ll have to sit in the corner is a just punishment. But a leftist will see a child pick up a toy they don’t want him to play with and punish him for doing so without reason or explanation. This is how these people were raised so they have no understanding of either justice or reason. Take that minor infraction and amplify it by an order of magnitude and you have the reason why the Left justifies criminal actions. This is why leftists believe right and wrong are not black and white, but gray, because they do not understand righteousness, morality, or ethics. The hateful children of the NFL have hijacked America’s sport for their radical social corruption on the basis of lies. Their right to free speech does not abridge the rights of the fans to not have that speech imposed on them, nor does it give them the right to stomp of the rights of the owners who pay them. By their reasoning, fire and policeman could stop doing their jobs to protest, hamburger flippers could withhold your order unless you listen to their grievances, and criminals would have the right to have their lies believed. You can speak and tell your story all you want, but no one can be forced to listen. You have the right not to listen, they don’t have the right to make you. The players have a right to say whatever they want, and the owners have a right to dismiss them from employment for it. No one has a right to steal from their employer as these players are doing. That the NFL has permitted this to explode on the national stage rather than crushing it as they should have is going to cost them dearly. NFL commercials and the Super Bowl will no longer be the ultra-expensive revenue farms they once were. Goodell and the foolish owners made a fatal mistake taking sides with the entertainers against the fans. The lies that this protest is not about the flag, the anthem, and America, doesn’t fool anyone! This is a criminal effort to demonize police in the name of phony racism. It is akin to blaming the gun for the crime rather than the criminal. Leftist ideology is always backwards thinking. 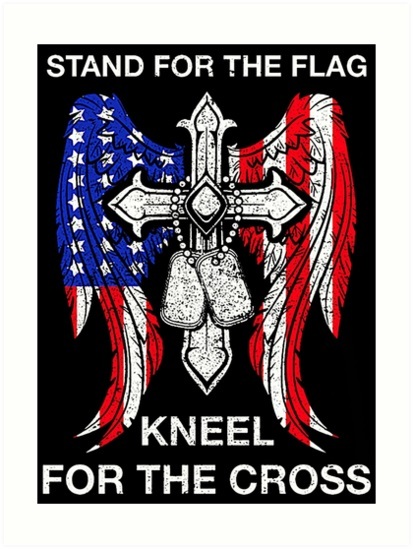 We stand for the Anthem, kneel for the Cross, and bow to no one! This entry was posted in Politics and tagged America, Black Identity Extremists, Christians, Conservatives, Criminals, Democrats, Leftist activists, Liberalism, NFL protests, Police, Republicans, Social Justice, TEA Party. Bookmark the permalink. Pingback: The Liberal Code of Conduct | Liberals Backwards Think – Shouting from the rooftop. . .